Micro-vignette based on an original wartime picture. Very limited production run. Casting quality is very good, with small parts on a thin carrier film (as usual for resin kits). Minimal clean-up is to be expected. 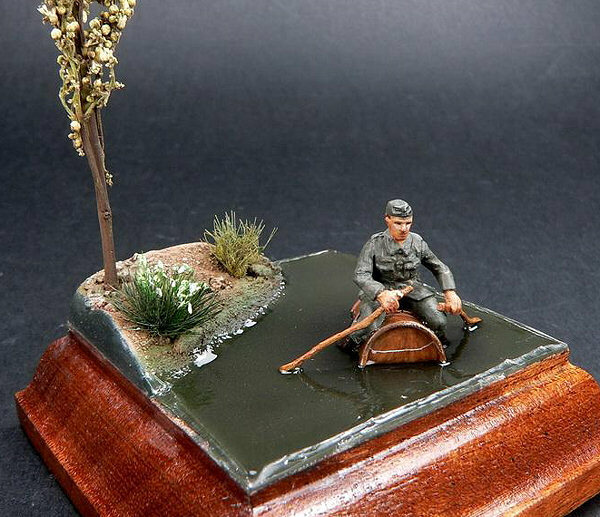 The set consists of one resin piece of a soldier on (half of) a barrel and two "ersatz" oars (actually wooden sticks), also in resin. The diorama base is not included. Nihil, except for a B/W picture of the original soldier on his barrel. Very good and very original. Nihil, except for the original picture of the soldier found on the FBMinis weblog.